"I want bluebirds!" If they are in your area, but aren't coming to your yard or nestboxes, here are some demonstrated and experimental approaches to attract them. Also see Bottom Line Advice for Bluebirders. Put up a nestbox specifically designed for bluebirds. A box sitting in your garage is not going to interest any birds. (Once you do get bluebirds to nest in a particular box or area, the likelihood of them or their babies coming back to the area next year improves.) Don't wait till a bluebird shows up to put a box - in the meantime other delightful native birds like chickadees and titmice might use it. Better yet, put up multiple nestboxes in a variety of styles. Peterson, NABS, and especially Gilwood styles may be preferred by bluebirds. Gilbertson's may not be preferred by House Sparrows or Tree Swallows. Sometimes a bluebird will prefer to use a different box for a second or third brood of the season. Put your nestboxes in the right habitat. Bluebirds like semi-open grassland habitat, such as mowed lawns or meadows, orchards, and roadsides (especially dirt roads), with scattered trees and short ground cover. Put the box near where you see bluebirds perching. If you have a lawn, mow the grass, as this makes it easier for bluebirds to hunt. If you want bluebirds instead of House Wrens, stay away from dense vegetation. If you want bluebirds instead of Tree Swallows, stay away from ponds or open water, or try pairing boxes 5-20 feet apart, so Tree Swallows may pick one and leave the other for bluebirds. Areas with fence lines, some medium size trees, or telephone lines provide perches for hunting and nest-guarding. Put up some perching sticks (T-shaped) if there are not enough perching spots in your area. Leave nestboxes up year round. Birds checking out future nest sites in the fall might find yours and come back to it in the spring, or might roost in it in fall and winter and then stick around. Clean out boxes. Bluebirds generally won't use a box that is filled with sticks from a House Wren or a stinky mouse nest. If you have paper wasps in your area, soap the box roof. Clean the box at the beginning of the season (February/March in CT) and preferably after babies fledge to encourage multiple broods. See instructions. Offer mealworms. Bluebirds usually can't resist them, but they do have to be trained to come to a feeder, and the worms are pricey (prices online are usually better than pet stores). If bluebirds don't nest in your boxes, at least you might get to watch them feed. Reduce local House Sparrow populations and competition through passive controls like fishing line and sparrow spookers on boxes, active controls like trapping, or a combination. House Sparrows harass bluebirds, and can peck eggs and kill nestlings and adults. Put out a birdbath. Bluebirds may prefer running or dripping water. Birds prefer birdbaths or shallow ponds. Birdbaths should be no more than 3" deep, with gently sloping sides, and a rough surface to provide good footing. Remember to change the water every few days to keep it fresh. It should be 15 feet away from shrubs or trees where cats may hide, but provide a perch nearby. Dripping water is very attractive to birds. A heated birdbath will provide water all through the winter. Any creek, springs or wetlands on your property should be preserved. More info. Plant native plants that produce berries that bluebirds like. More info. Play a recorded bluebird song. This may attract nearby bluebirds to your yard. Try not to do this excessively during nesting season, as it could draw birds away from important activities like guarding their nest site, caring for their babies, getting food, etc., which could interfere with their behavior or survival. It could also theoretically increase stress if established birds think their territory is being invaded. Face entrance holes towards the east (may be preferred for early broods because of morning sun, and preferred by bluebirds versus other species) but away from prevailing winds. Try stenciling a dark entrance hole ("attraction spot") on the roof and sides of the nestbox to make it obvious to passing birds that it is a nesting cavity. You could also staple/thumbtack on "holes" made of tar paper. Some folks remove them after the box is claimed to avoid attracting competitors. A light colored front that makes the dark entrance hole more conspicuous may be recognized more readily by bluebirds. Locate a spot where white pines are growing. Scoop up a small pail full of the dry needles underneath the pines. Throw a few handfuls near where the BB's are examining nestboxes. They may use them to build a nest. Tie a strip of royal blue plastic marking ribbon, or a loose strip of blue cloth to the pole by the roof to simulate "wing-waving." Don't use cloth that could unravel, as a bird could get tangled in threads! Or try a wooden flag painted blue. This could be a 3/4" thick triangle, or a piece of wood 8" x 7" x 3", shaped like the profile of a bluebird. Some people report bluebirds showing up within hours using this ploy. Others have painted the image of a bluebird on the box itself. (Decoys help attract purple martins, but they are communal nesters. NOTE: Some people think more realistic decoys (like a playback recording) might stimulate concern over territory and could actually deter, distress, or aggravate bluebirds, as they are territorial. Breeding season is already pretty stressful for birds. One thing I can guarantee won't work is giving up. I read about someone who waited six years, and another who waited 13 years before bluebirds graced their nestbox. It's worth the wait! 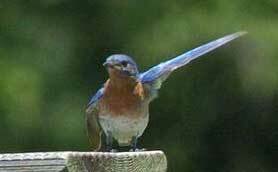 Photo of wing waving male Eastern Bluebird by Wendell Long. Last updated April 21, 2017. Design by Chimalis.